On behalf of the active chapter membership, I would like to thank our alums who have been generous in donating their money, time and moral support to Michigan Alpha. Your backing is critically important and tremendously appreciated. I especially wish to thank the leaders of the Alumni Association/House Corporation and the Chapter Advisory Board for donating countless hours of your time to help the active chapter stay focused on the right direction while also keeping our historic 108 year old chapter house in outstanding condition. It is clear that fraternities with strong alumni participation and support enjoy a significant advantage over other houses. 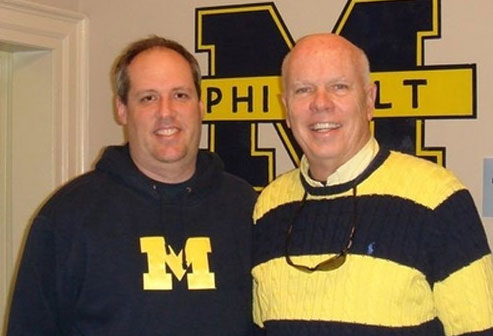 Based on what I've seen and heard as president, I think Michigan Alpha's alums are best in the U of M Greek System. There is no question in my mind that a big part of Phi Delta Theta's success on U of M's campus has been made possible because of our alums. The active chapter is mindful that your support must be earned every year – we take nothing for granted. I am pleased to say that the fraternity is continuing to grow and improve. Michigan Alpha is fulfilling its mission to be a leader in the U of M Greek System while making a positive impact on the campus and the Ann Arbor community. PDT was highly competitive in the Fraternity League, making the "A" team playoffs in volleyball, wallyball, water polo and broomball. Our collective efforts resulted in a 3rd place finish in the Fraternity League for the 2010-2011 year. With many veteran athletes returning this fall, we expect to be in the hunt for an IM Sports Championship. Given that PDT finished among the top 3 in the Fraternity League for two straight years (2nd place during the 2009-2010 year), we have solidified our reputation as aggressive competitors. During the winter term, the chapter maintained a GPA of 3.27 which places us above the all-fraternity campus average of 3.17, all-men campus average of 3.19 and overall campus average of 3.24. Even more impressive was our freshmen class GPA of 3.34 that soundly beat the all-male freshmen average of 3.16. The chapter placed a renewed emphasis on winter rush, and our hard work paid off with one of the largest pledge classes for that time of year in the history of the fraternity. We recruited an excellent pledge class of 14 men who are all assets to our fraternity. The class features diversity with men hailing from as far away as Sweden and Portugal. After the 2011 graduation, our active membership totals 56; this places us close to the all-fraternity average of 62 members. It has never been our goal to be the largest fraternity on campus as we believe that one of the hallmarks of Michigan Alpha's historic success is the opportunity for men to participate in multiple activities and leadership positions. Most importantly, we have achieved a size that allows us to know every member of the fraternity -- a feat not possible in some houses that strive to be the biggest in numbers rather than best in quality. A testament to our close-knit philosophy is the fact that 52% (29 men) of our total membership will be living in the chapter house during the 2011-2012 year. In some "big" fraternities, less than half of the members ever live in the chapter house even one year – they never really get to know the majority of the members. In addition to keeping busy with activities in the chapter, Michigan Alpha members are involved in campus activities such as the hockey club, crew team, rugby club, ROTC, investment club, debate club, Michigan triathlon team, snowboarding club, fishing club and many other organizations.